Explore the wonders of southeast Asia on an premium river cruise with the AmaDara. This river boat takes you on a one-of-a-kind journey through Thailand, Cambodia and Vietnam along the Mekong river. Enjoy a one-of-a-kind cruise experience through southeast Asia with the AmaDara. Sailing along the Mekong river, the ship travels through Cambodia and Vietnam, starting or ending each cruise in Ho Chi Minh City. Passengers can receive a blessing by Buddhist monks, take a tuk-tuk ride, and make unforgettable memories with the people who live there. 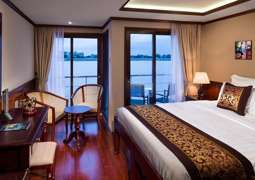 A Mekong river cruise is a wonderful way to immerse yourself in the culture and history of this part of the world. AmaDara is a modern, elegant river boat with contemporary furnishings and an Asian flair. Artwork and artifacts onboard are made by native Mekong craftsmen, and the dark wood paneling and shimmering gold upholstery create an atmosphere of timeless luxury. Small touches such as complimentary bathrobes and bottled water in every stateroom will keep passengers happy and comfortable, and the onboard comforts and conveniences will make guests feel at home. With balconies on every stateroom, floor-to-ceiling windows in the dining areas and an open-air sun deck and pool, there are plenty of opportunities to take in the scenery and watch the world go by. Staterooms on the AmaCerto are spacious and sophisticated. Furnished in earth tones, white and gold, they provide the perfect sanctuary for relaxation after a long day of port excursions. Innovative twin balconies allow for more comfort and flexibility while cruising: Guests can enjoy the fresh air while sitting on a classic balcony, or enjoy floor-to-ceiling scenic views from the comfort of indoors behind the windows of a full French balcony. Staterooms come with a writing desk, a flatscreen TV, bathrobe and slippers, a telephone and a hair dryer, and suites additionally have a bathtub, a king-sized bed, and an expansive sitting area. The only cruise line to be a member of the elite culinary society Chaine Des Rotisseurs, AmaWaterways is known for the quality of its dining. On the AmaDara, you can experience the culinary specialties of the Mekong region, as well as classic Western cuisine. The ship's specialty restaurant, the Chef's Table, serves gourmet dishes prepared by master chefs right before your very eyes. House-brand beverages are included in the cost of the cruise, and wine flows freely during lunch and dinner. Entertainment on the AmaDara mostly revolves around the cruise destinations, with the cruise director giving a nightly lecture on the upcoming ports of call. The elegant Saigon Lounge provides the prefect place for daytime relaxation or evening entertainment. And the ship has not one but three onboard spas, meaning there are plenty of opportunities to book a massage or a beauty treatment, many of which are also inspired by the region the ship is visiting. The AmaDara has a casual dress code, with passengers encouraged to bring comfortable shoes for walking tours and weather-appropriate clothing. Additionally, passengers should bring at least one set of clothing that covers their arms and legs due to dress codes at certain destinations, such as a visit to a monastery.